The following information was shared with the library community via the MLA and ITEM Legislative Update Newsletter Monday, May 7, 2018 by Sam Walseth, Capitol Hill Associates, in his role as the MLA-ITEM lobbyist. Two weeks from today the 90th Legislature will adjourn sine die, meaning never to return. As usual, all of the major decisions will pile up at the end of next week as leadership from all corners tried to position themselves for the best deal from their perspective. At this time there’s a deep sense that they won’t be able to come to terms on the tax conformity bill and therefore a Supplemental spending bill and potentially the bonding bill will fail to emerge. The Supplemental budget conference committee has yet to be named, but we’ll likely see it emerge today and perhaps a public meeting early this week. A pension overall bill is hopefully making its way out of a necessary House committee today and will survive the process. The Tax committees in the House and Senate will be debating a constitutional amendment that would dedicate hundreds of millions in auto part sales tax revenues to road and bridge projects this week. Some of the union trade groups are supporting this proposal, while many labor groups oppose it because it will create a permanent hole in the state’s general fund, making it difficult to fund education and HHS service when revenues get tight. The House Capital Investment committee unveiled a bonding bill and it includes $2 million for Library construction and renovation grants. The bill was debated and passed out of committee last Friday. The Governor has said the bill’s total of $825 million in general obligation bonds is too low to meet the state’s needs. It’s unclear if Chair Dean Urdahl has a super-majority of votes to pass this bill off the House floor. “Thank you” notes to Chair Urdahl will be well received. He talked about the merits of the library bonding program on Friday when they went over his bill. At this time we haven’t seen a Senate bonding bill emerge yet. The battle over what to do with potentially unspent RLTA funds will come to a head in the supplemental budget bill conference committee negotiation, which will mostly take place behind closed doors. MLA wants the House position to prevail and that’s how folks should talk about the issue if they’re reaching out to conference committee members. We don’t know who those conference committee members are at the moment, but we know that Chair Jennifer Loon (GOP Eden Prairie) will most likely be one of them. Comments of “thank you for your support of RTLA for public libraries” and “please defend the House position” can be send to Chair Loon this week. She’ll appreciate knowing we’re still invested in this issue and are paying attention. During debate on the Senate’s supplemental budget bill, Sen. Ron Latz offered an amendment that would have required internet service providers doing business with the state and local government units to abide by net neutrality principals. The amendment was challenged for not being germane to the budget bill and was ruled out of order. The Governor proposed $30 million for broadband funding. The House and Senate have proposed $15 million. The fate of new broadband funding lies with getting a deal on the supplemental budget bill. Sen. Latz was able to get language amended into the Senate’s supplemental bill that gives priority to broadband grants to recipients that abide by ‘net neutrality’ rules. A school board must adopt a written academic balance policy. At a minimum, the policy must prohibit discrimination against students on the basis of political, ideological, or religious beliefs. A student must not be required to publicly identify their personal beliefs, views, and values for the purpose of academic credit, classroom, or extracurricular participation. The policy must include reporting procedures and appropriate disciplinary actions for policy violations. The disciplinary actions must conform with collective bargaining agreements and sections 121A.41 to 121A.56. A district must post the policy on the district’s Web site during the 2018-2019 school year, provide a copy to each district employee, and include the policy in subsequent editions of the student handbook. The following information was shared with the library community via the MLA and ITEM Legislative Update Newsletter Friday, April 20, 2018 by Sam Walseth, Capitol Hill Associates, in his role as the MLA-ITEM lobbyist. There are four weeks left of the 2018 legislative session and as expected all the major decision-making will come down to the last weekend (May 18-20). The state’s constitution prescribes Monday, May 21 as the last day, but it also stipulates that the legislature cannot pass bills on a day prescribed for final adjournment (when they adjourn ‘sine die’). Therefore, midnight on Sunday, May 20 is the last chance for the legislature to pass bills. The House and Senate are currently in the process of assembling their omnibus supplemental spending bills that encompass change items across all of state government. In the ensuing week or so we’ll see the House and Senate produce a tax bill aimed at addressing conformity issues with the new federal tax law. 2018, being the even numbered year in the biennium, is the traditional year for a bonding bill. The bonding bill process has always been a backroom ordeal, making it difficult to track progress on any one proposal. Don’t expect to see a lot of public process on the bonding bill. It will emerge amidst a global deal in the final hours of session. What’s specifically at stake for MLA-ITEM? A public employee pension bill aimed at improving the solvency of the various pension funds is in the mix. The Senate didn’t hesitate to move this bill out and approved it 66-0 in March. House GOP leadership will hold the bill until the last days of session as bargaining leverage for the infamous ‘global’ negotiations yet to come. The supplemental budget bill could impact Regional Library Telecommunications Aid (RLTA), broadband funding and force school districts to implement ‘academic balance’ policies; legislation birthed from a culture war dust up in Edina schools last fall. Funding for library construction and renovation grants are at stake in the bonding bill. The Governor’s supplemental E-12 bill notes the potential for $350,000 in unspent Regional Library Telecommunications Aid (RLTA) in the current fiscal biennium. Instead of re-purposing these funds for Regional Library Basic System Support (RLBSS), the administration decided to recommend transferring any unspent RLTA funds to the school Telecommunications Equity Aid (TEA) program. MLA has been working with the House and Senate to keep these public library funds in the public library fiscal world. Despite testimony from the MN School Boards Association (MSBA) saying they want the funds for TEA, the House Education Finance committee is recommending keeping unspent RLTA funds in public library budgets. The House doesn’t go quite as far as MLA had requested in terms of using the funds for general operating purposes. The House supplemental E-12 budget bill would have the MDE Commissioner work with the regional library systems to re-purpose unspent RLTA funds next March on a variety of broadband and technology expense in a more flexibly manner than the limitations of the federal e-rate program (which RLTA is tied to). The Senate acquiesced to the MSBA position and their supplemental E-12 bill calls for cancelling unspent RLTA funds back to the state’s general fund and then the bill appropriates $440,000 for TEA. The bill doesn’t make a direct link between unspent RLTA and TEA in how it’s written, but Senate E-12 Chair Carla Nelson confirmed the move and her intent when I testified on behalf of MLA asking to keep the funds in RLTA. Chair Nelson said while she hoped to address library funding issues in the next budget session, she needed these funds for TEA in this non-budget/supplemental session. MDE has informally said they support MLA’s request to keep the public library RLTA funds in the public library fiscal world. The issue will be sorted out in the supplemental budget conference committee that will organize in the next week or so and will work until the end of session. Governor Dayton has proposed an additional $30 million for community broadband funds. The House and Senate supplement bills include $15 million for broadband. Senate Jobs Chair Jeremy Miller spent $15 million of his $17 million on broadband, showing strong support in the Senate. Senator Rich Draheim offered an amendment that would require oversight of broadband service providers and internet speeds. Sen Draheim proposed that providers be required to disclose on their billing statements the average speed they are receiving during the billing period. However, the amendment was withdrawn in the spirit of solely focusing on funding the fund this year, without policy changes, as had been the position of the Rural Broadband Coalition. In the House, Chair Pat Garofalo also spends $15 million on broadband, but he earmarks $750,000 for satellite providers. The funds are to be spent on 1,000 unserved consumers to aid in satellite equipment installment as well as to lower monthly subscription fees for one year. The Rural Broadband Coalition was disappointed at the amendment, especially since the satellite providers only are only required to meet speed goals of 25/3. Talk of state actions to curb the impact of the FCC’s decision to repeal net neutrality rules have been quiet since January when two DFL law-makers announced they would push legislation to address the issue. However, earlier last week Sen. Karla Bigham (DFL Cottage Grove) and Rep. Debra Hilstrom (DFL Brooklyn Park) introduced legislation (SF 3968 and HF 4411) that would require internet providers doing business with the public sector in Minnesota to abide by net neutrality provisions. The session process is well past policy bill deadlines and the GOP majorities weren’t likely to take up these bills anyway. However, we may see these members make an attempt to offer this legislation as a ‘floor’ amendment in their respective bodies if they can find a bill that is germane to this issue. The following information was shared with the library community via the MLA and ITEM Legislative Update Newsletter Thursday, March 1, 2018 by Sam Walseth, Capitol Hill Associates, in his role as the MLA-ITEM lobbyist. On Wednesday, the state released an update to last December’s budget forecast. The good news is a previously projected $188 million deficit has turned into a $329 million surplus. Help from the federal government in the form of Children’s Health Insurance Program (CHIPs) funding helped reduce state expenditures in the Health & Human Services budget area by $247 million. The federal tax bill is pushing up GDP numbers and corporate tax collections have increased. Still, the $329 million surplus figure represents less than 1% of the total state $46 billion biennial budget. Governor Dayton and DFL lawmakers urged caution on additional spending and suggested that a bonding bill in the neighborhood of $1.5 billion is the more appropriate focus for this session. GOP lawmakers met the forecast numbers with skepticism, suggesting the GDP figures and tax collection assumptions are artificially low. The bottom line is today’s forecast, while positive in that we have a surplus, does put a damper of hopes for additional budget items this session. The following information was shared via email with the library community Thursday, February 15, 2018 by Sam Walseth, Capitol Hill Associates, in his role as the MLA-ITEM lobbyist. Ann Walker Smalley & I met with Senator Ron Latz (D-St. Louis Park, SD46) to discuss his legislation on net neutrality. We offered the support of MLA+ITEM as the bill is introduced. Sen Latz’s office supplied these Net Neutrality Talking Points. There is still time to register for Library Legislative Day and make appointments to visit your legislators to discuss the MLA+ITEM Legislative Platform. Do it today! There is a new newsletter for MLA & ITEM members to receive legislative updates from Sam Walseth of Capitol Hill Associates. Capitol Hill Associates is the lobbying firm representing MLA, ITEM, the multicounty multitype library systems, & the regional public library systems at the Minnesota Legislature. In addition to the updates from Sam, the newsletter will offer announcements of events, advocacy tips, templates for phone messages/email, news about legislative activities including Legislative Day (March 6, 2018), Legislative Forum (August 8, 2018), and other news & information you can use in your advocacy efforts. It will include updates on national library issues, too. The mailing schedule is intermittent–it depends on what is going on at the Legislature and how it affects libraries. The 2018 Legislative session starts February 20, 2018, and updates from Capitol Hill Associates will be posted here as well. The Legislative Update newsletter is a benefit to members of MLA and ITEM. The following information was shared via email with the library community Tuesday, January 16, 2018 by Sam Walseth, Capitol Hill Associates, in his role as the MLA-ITEM lobbyist. to fund $2.5 million to for Library Construction and Renovation grants. agencies and $831 million from local governments). The Minnesota Library Association (MLA) is seeking entries in a “Because” statement contest. Based on the American Library Association’s (ALA) Libraries Transform campaign, they’re designed to increase awareness of the value, impact, and services provided by libraries and library staff. As we prepare to advocate for Minnesota libraries in the coming year, we’re proposing a Minnesota spin on the Libraries Transform initiative and would like to create several uniquely Minnesota “Because” statements. We’re seeking submissions from library supporters. These statements can be about the services and value you see in any type of library (public, academic, school, government, and others). Your submissions will be collected and used for virtual library legislative week in Minnesota, March 5-9th, 2018. 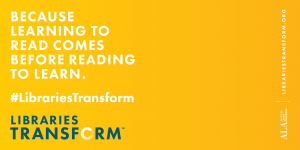 One lucky winner will receive a large print of your Minnesota Libraries Transform Because statement.